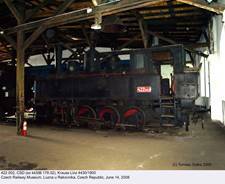 422.025 ‘Arcivévoda Karel’, ČSD, in the shed at the Czech railway museum, Lužna u Rakovnika; June 14, 2008. 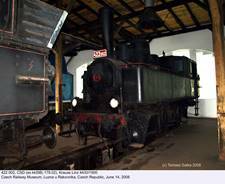 Another engine from the Czech railway museum collection: 422.002 (ex kkStB 17802, later 178.02, Krauss Linz 4430/1900), photographed on the same occasion. … and yet another, this time still as kkStB 17802. Source: Die Lokomotive July 1906. ŽSR 422.0108, photographed in Sucha Beskidzka on September 6, 2008. Photo by Ryszard Rusak (thanks for permission!). 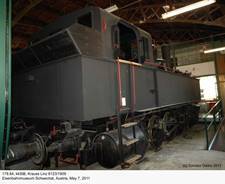 KkStB 178.97 (Krauss Linz 6249/1910) awaits reconstruction at the Heizhaus Strasshof; photo taken on June 20, 2009. 178.84 (Krauss Linz 6123/1909) later served with BBÖ as 92.2231, survived WWII and was finally withdrawn in March 1970. 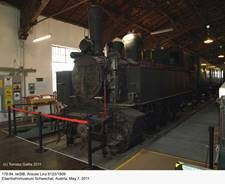 It can be seen at the Eisenbahnmuseum Schwechat. May 7,2011. Another picture of the 178.84, taken on the same occasion. Slovakian 422.0108 again: August 20, 2000. Postcard from my collection. Austro-Hungarian 178.62, BMMF 266/1908. Postcard from my collection – probably a factory photo. Former kkStB 178.95 (Krauss Linz 6247/1910) armored in Poland and used with the armored train ‘Paderewski’. Location unknown, probably 1919. This engine later became TKp11-17 and fell into Soviet hands in 1939. Source: Railway Museum archive (via Quixi Media). 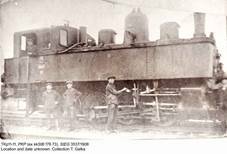 TKp11-11 (ex kkStB 178.73, StEG 3537/1908), location and date unknown. 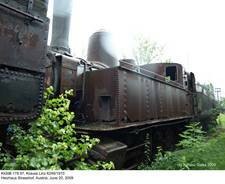 This locomotive was written off before 1936. Photo from my collection. Side drawing of class 178; source: Triebfahrzeuge österreichischer Eisenbahnen: Dampflokomotiven BBÖ und ÖBB (see References). In 1898 Lokomotivfabrik Krauss & Comp. of Linz an der Donau built two tank locomotives with the 0-4-0 axle arrangement for the Wiener Neustadt – Puchberg line of Schneebergbahn (service numbers 21 and 22, serials 3866 and 3867). They ran on saturated steam and featured compound steam engines, no doubt under the influence of renowned Karl Gölsdorf, who was a keen advocate of compounds. 1st and 3rd axles were fixed, while both 2nd and 4th axles had ± 23 mm side-play, which allowed for negotiating curves 80 m in radius. Service tests were satisfactory and in 1900 a slightly modified variant was ordered by kkStB state railways as class 178. Until 1918, kkStB received 213 examples. Production was resumed in 1922 and until final termination in 1924 further thirteen followed (178.214 through 226), plus one more originally ordered by Steiermärkische Landesbahnen (178.232) and one by Wiener Lokalbahn (178.900). 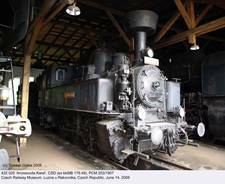 The latter was fitted with a single-expansion steam engine. This not particularly advanced, but reliable and useful engine was also ordered by other railways. Eight were built for k.k.priv.Eisenbahn Wien-Aspang between 1900 and 1920 (this railway merged with Schneebergbahn in 1919), eight for Niederösterreichische Landesbahnen (three in 1912 and five in 1919, class 104) and two in 1916 for Militärschleppbahn Steinfeld. After the war all these engines were taken over by newly-formed state railways BBÖ as 178.295 through 304 and 178.801 through 810. This gives a total of 248 examples which served with kkStB and/or BBÖ, although some sources give 227, which refers to those originally ordered by state railways. Most were built by Krauss Linz (182), other manufacturers included BMMF (17), StEG (16), Wiener Neustadt (14) and WLF (19). At least ten more were purchased by various other private railways. There were several variants; in particular, first 39 examples for kkStB had boiler pressure of 12 bar, while all other had 13 bar. Depending on water capacity (5.2 or 7.5 cu.m), coal capacity (1.9 or 2.5 tonnes) and various minor differences, empty weight ranged from 36 to 38.5 tonnes, which corresponded to 46 – 52 tonnes in working order. Engines with larger water capacity could be distinguished by longer waterboxes, which were extended forward by almost one metre, so that their front walls were in line with smoke-box door. In many examples one waterbox (usually the right one) was shortened to make room for the compressor – it seems that it was introduced during overhauls, when Hardy vacuum brakes were replaced by more modern air brakes. 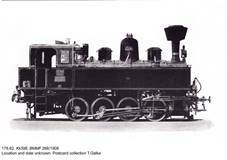 Early production 178s had large, Rihosek-type spark arrester, which was later deleted. After WWI almost half of 178s owned by kkStB (105 examples) went to Czechoslovakian state railways ČSD. Later this company took over nine more engines after nationalization of several private local railways. All were classed 422.0; last of them was written off in 1970. BBÖ kept fifty engines, plus the above-mentioned twenty from other railways; after the Aschluss they were taken over by DRG (classed 9222-23, together with those captured later in Czechoslovakia, Poland and Yugoslavia). Italy had twelve (FS class 893), Yugoslavia seven (JDŽ class 52) and Romania six (operated with original kkStB service numbers). Finally, six ended up it the Soviet Union. According to stock lists available at www.pospichal.net/lokstatistik, Poland took over 27 engines of this type, of which all but one were classed TKp11 and assigned service numbers 1 through 26. LP gives a total of 28 engines. Details on one of them (TKp11-27) are lacking, apart from boiler number, and it seems possible that this is 178.71 (StEG 3535/1908), which was written off before 1926 – but this is only my conjecture. TKp11-28, accepted by PKP in 1937 (WrN 5559/20), was taken over from a private company; details are lacking and further fate of this engine after 1939 is not known. (Many thanks to Piotr Staszewski for information on this example.) As many other locomotives of Austrian origin, most TKp11s were operated in southern and south-eastern Poland, where their low axle load, not exceeding 13 tonnes, and ability to negotiate tight curves could be best exploited. 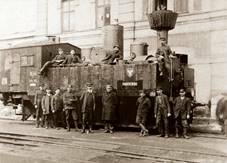 Six examples (including the above-mentioned 178.71) were converted to armored locomotives in Lwów between 1918 and 1919 and later used with armored trains in south-eastern Poland. They were returned to PKP in early 1920s (confirmed service numbers are TKp11-6, ­-15, -16, -17 and -19). Two or three TKp11s were written off before 1939. After the September campaign, most of them (probably fourteen) fell into Soviet hands. They retained their original PKP designations, written in Russian script; according to LOZD vol.1, some were converted to the 1524 mm track, but their exact number is not known. Nine were captured by Germans and impressed into the DRG service as 92 2202 through 2210. Only three TKp11s were returned after the war. TKp11-4 (Krauss Linz 5693/1907) and TKp11-25 (Krauss Linz 6869/1914) became TKp11-1 and TKp11-2, respectively, but their post-war service – as with many other ex-Austrian types – was very short: both were written off in 1950. TKp11-12 (StEG 3538/1908) was not given new number and was written off in 1946. Given short post-war service of TKp11s and their small number, it is no wonder that none has been preserved. Fortunately, as many as eleven examples still exist elsewhere: in Austria (four), Czech Republic (four), Slovakia (two) and Slovenia (one). 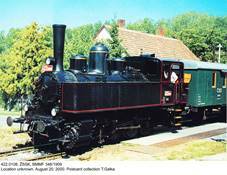 They include the last example in the ČSD service (BMMF 346/1909), which had originally been built for the Nesamyslitz-Markowitz Lokalbahn and never served with kkStB. Taken over by ČSD after nationalization of the local railway in 1938 as 422.905 (later re-numbered 422.0108), it was withdrawn in 1970. 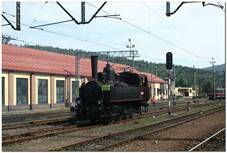 Formally owned by Slovakian railways ŽSR and based in Zvolen, this engine is kept in working order and sometimes runs with special trains. 422.025 ‘Arcivévoda Karel’ (ex 178.49, BMMF 203/1907) is another operational engine of this type: a property of the Czech National Technical Museum of Prague, it is based in Lužna u Rakovnika. Possibly they will be joined by ex-WLB No.72 (Krauss Linz 7327/1919) from Zwettl, Austria, which has recently undergone a general overhaul (according to www.dampflok.at completed in March 2008). This engine currently has a fictitious post-war ÖBB designation 92.2271, although it never served with state railways; in fact, 92.2271, BBÖ 178.217, was written off in 1968. - Plus a dozen or so more for various local railways; several variants. - One with on PKP service number, withdrawn before 1926. - 1.22 MPa in first 39 examples for kkStB. - Triebfahrzeuge österreichischer Eisenbahnen: Dampflokomotiven BBÖ und ÖBB by Heribert Schröpfer (Alba, 2002).